Black Ice Software - Printer Driver 14.14 is released with new Profiles! Printer Driver 14.14 is released with new BiCommandLineConverter! New Predefined Profiles for applying commonly used settings for conversions! Black Ice Software has released the Printer Driver version 14.14 including new predefined Profiles for applying commonly used settings for the conversions, such as printing to Fine FAX resolution, Standard Fax Resolution or printing documents to PDF. 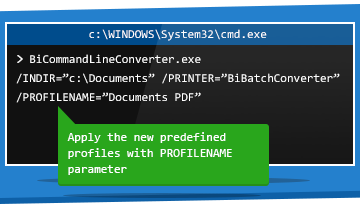 In version 14.14 of the Black Ice Printer Driver users can select the predefined profiles in the Control Panel > Devices and Printers > Black Ice Printer Driver Printing Preferences > Profile Manager Tab and also can be applied in the newly introduced BiCommandLineConverter by using the PROFILENAME parameter. Beside the new predefined profiles, the Black Ice Printer Driver version 14.14 includes updated manuals, and minor user interface improvements to enhance user's experience. Don't forget to subscribe to future releases by purchasing maintenance. With an active maintenance subscription, you will receive all new releases of your software for free with your subscription! Also included with your Subscription is Priority email technical support. For more information call us at +1 (603) 882-7711 Extension 2, or sales@blackice.com.